Mayan civilisation came into being in the 1st millennium B.C. Although the Mayans borrowed many cultural elements from the older Olmec civilisation, Mayans had unique forms and styles in arts and crafts which distinguished them from previous and contemporary cultures in Mesoamerica. Among the popular art forms of the Mayans was monumental architecture, stone sculptures, wooden carvings, painted ceramics, stucco models, jewelry made from precious metals and stones and body decorations such as tattoos. Mayan society valued truly skilled artists and esteemed them accordingly. Artists, although of commoner origins, were considered one station above the other commoners. Nearly all extant sculptures from the Mayan cities are done in stone. Most of these sculptures were carved in order to decorate different buildings. A specific type of stone sculpture was large slabs of stones called stelas. Stelas were typically located at a monumental structure and carried carvings of Mayan gods and warriors, and had inscriptions related to Mayan religion or mythology. Another type of stone sculpture was the stone lintels and carvings used in the homes of royalty and nobility. Such sculptures from different Mayan cities are among the most critical source of Mayan culture for modern scholarships. Wood carving was another popular form of Mayan art. Since wood was far less durable than stone, most Mayan wood carvings perished either because of their age or at the hands of different conquerors during different periods. However, some wood carvings from Mayan cities have survived to this day and are surprisingly well preserved. 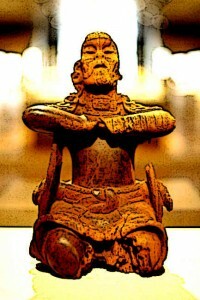 Most of the extant piece of Mayan wood carvings depict Mayan gods or kings in different scenarios. Some of them, for instance, depict the Mayan jaguar god while another depicts the war serpent, the serpent being a very common mythological motif for Mayan arts. Mayan architecture was another face of the civilisation’s arts. Nearly all major Mayan cities had monumental architecture in the form of pyramid-temples, palaces, plazas and other structures such as astronomical observatories. Mayans built all their monumental architecture with stone and used an exceptionally strong mortar for durability of the structure. Among the extant architecture from Mayan cities are ball courts, palaces, pyramid-temples and central plazas of ancient cities. Mayans frequently borrowed aspects of architecture from neighbouring cultures and people to incorporate them in their monumental buildings. Although ceramics were used for more practical purposes in the Mayan society, as wares for cooking and eating, they also served a more important function as being pieces of art. This latter position was because of the fact that Mayans deployed different techniques to paint their ceramics that depicted gods, animals and other scenes on them. This was done by painting the ceramics while their clay was still wet. Throughout the Mayan world, different styles were used to produce different types of ceramics. These included the Ik style and the Chama style among others. It was fairly common in Mayan cities to bury vast quantities of ceramics along with a deceased nobleman, as a way of helping him in his journey through the underworld. Jewelry was one of the major forms of Mayan arts and crafts. Mayans initially made jewelry out of flint, shell and bone. Such jewelry was often made in the form of pendants and necklaces. Later, Mayans discovered precious metals such as gold and silver in their region. This led to the creation of beautiful and highly intricate jewelry made from these metals. Artists trained at other cities were brought to Mayan cities to produce such jewelry and over time, jewelry became a major part of Mayan exports to other cities. Precious materials such as jade were also commonly used in making jewelry by the Mayans. Mayans were expert builders which led them to develop different kinds of materials related to architecture. Notable among these was a kind of stucco plaster which Mayans successfully developed and began using as early as the Pre-Classic period. The use of stucco plaster continued into the Classic period of the Mayan civilisation as well. Stucco was most commonly used to create elaborate decorations on the exterior of the buildings. In some cases, it was also used to depict the representations of Mayan gods, or to depict Mayan kings in stucco portraits. Many extant Mayan temples have heads of Mayan deities done in stucco plaster. Mayans frequently painted murals on the interior of monumental buildings and homes of the nobility. Such murals have been found in well-shielded locations across many Mayan cities. The common motif of the extant Mayan murals is warfare, ritual sacrifices, scenes from the daily life of the nobility and often decorative elements such as floral patterns. Many murals also depict Mayan deities such as the maize god and Mayan rulers. Most of the Mayan murals were painted in the homes of the rich elite as well as in the vaulted tombs of the nobility. A notable feature of Mayan murals is that while the murals painted in the homes are more colourful and makes use of a variety of shades, those in tombs are done in black over a whitened surface, occasionally using the red colour. Mayan civilisation had a large variety of highly developed arts and crafts. These included Mayan architecture which comprised of monumental buildings such as temples, palaces and ball courts, many of which are extant today. Other art forms included painted ceramics in different styles, stuccos used to decorate the walls of the temples, mural paintings used to adorn the homes of the nobility and their tombs. Stone sculptures were also another art form in Mayan society. It was frequently a feature of monumental architecture where slabs of stone were often carved to depict gods, warriors and other motifs. Wood carvings were also a common Mayan art form, although few extant carvings from the Mayan period exist today. Jewelry was one of the foremost Mayan crafts. Mayans made jewelry with precious metals as well as with precious stones. Mayan artisans were highly skilled in their crafts and their produce was in high demand in other cities, being a key item of Mayan exports.